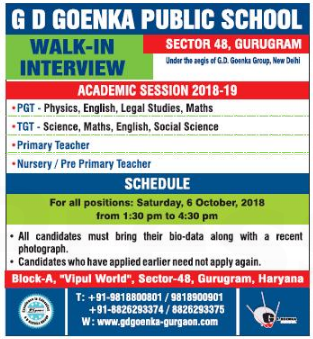 G D Goenka Public School, Gurugram has advertised in THE HINDUSTAN TIMES newspaper for the recruitment of Teachers- PGT / TGT / PRT / NTT / PPRT jobs vacancies. Interested and eligible job aspirants are requested to walk-in on 06th October 2018. Check out further more details below. About School: We welcome you to G.D. Goenka Public School, Sector 48, with a commitment to nurture and equip young learners with the uncommon ability of self exploration and development. Our aim is to nurture the children to become confident, sensitive, socially committed and well rounded individuals, equipped to become young envoys of progress. Our children grow in the best of environment and under the guidance of competent faculty, elements indispensable today for gaining knowledge and understanding. As per CBSE norms. Candidates who have applied earlier need not to apply again. How to Apply: Interested and eligible candidates are requested to attend the Walk-in interview by bringing their bio-data along with recent passport size photos and supporting document to the walk-in address provided below.